Many of these products are also available frozen, unbaked on request. A selection of the flavours of sausage that we produce fresh, daily. Our fleet of vans - ready to hit the roads of Yorkshire with our award winning produce! 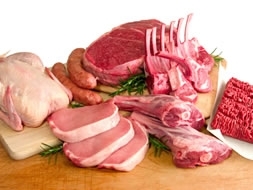 We pride ourselves in the consistent quality of our products which include fresh and cooked meats, a tasty selection of sausages, a range of quality pies and pastries, traditional confectionery and savoury goods. We pride ourselves on our First Class Service and our Free Local delivery. Please feel free to view our product range on our website. We look forward, in anticipation, to being of service to yourselves in the future.